Nelson Mandela’s life of 95 years is being honored in Soweto today. But before Mandela was a sainted founding father of modern South Africa, he was a political prisoner in nation split by apartheid. Local activists still remember the day 32 years ago when the city of Albany briefly took center stage in the struggle. In his remarks today at the gathering honoring Mandela, President Barack Obama made a passing reference to the Springboks. 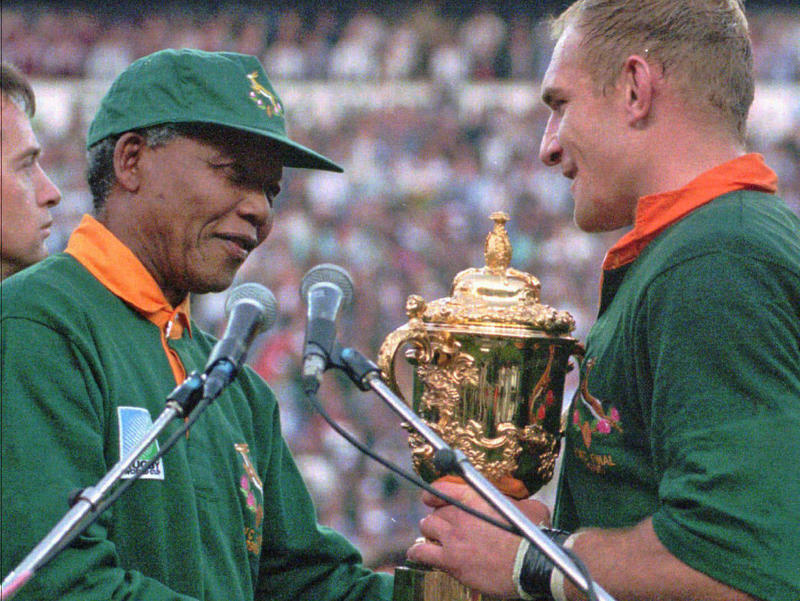 Rewind to September 22, 1981 – a rainy night when the South African Rugby Team and the city of Albany met on the crossroads of destiny and history. The Springboks - described as a "mixed race" team of rugby players, arrived in Chicago a week earlier, resulting in several days of demonstrations, with the end of apartheid still more than a decade away. Chicago canceled the team's scheduled match; the South Africans played a private game in Racine, Wisconsin, then prepared to travel to New York for what would become their only public appearance in the U.S. In Albany, Vera Michelson co-chaired the newly-formed Capital District Coalition Against Apartheid and Racism. "There was a cultural boycott and a sports boycott that had been very important in the struggle against South African apartheid. President Reagan had given the Springboks the visas to come, and this was in violation of the sports boycott. So we got very interested in what was going on, started attending meetings, and I did also, and started with many other people doing some organizing in Albany. Andi t was about four months during the summer, of continuous educational campaigns, because at that time, a lot of people really were uninformed about what apartheid really was, and who Nelson Mandela was, so we had a lot of work to do." The city was on edge as the calendar neared September 22nd. Hoping to sidetrack trouble of whatever kind, Albany Mayor Erastus Corning and Governor Hugh Carey tried to stop the game: Judge Howard G. Munson of Federal District Court in Albany issued an order enjoining Carey from canceling the match. Tensions mounted. Nine hours later, a bomb was detonated at a Schenectady office building that housed the Eastern Rugby Union headquarters. Activist Attorney Mark Mishler was a newcomer to Albany... "It was really sort of a perfect storm in the sense that this had all been brewing for some time on college campuses around the country as well as in labor unions as well as in other kinds of settings. People were becoming more and more aware of apartheid and our government's role in that. September 1981 it sort of all came to head when this public relations gambit by the South African government arrived in Albany." At that time, political music and protest songs were "out" in America – No. 1 on the U.S. top 40 that week was "Endless Love" by Diana Ross and Lionel Richie, which spent nine weeks at the top... South Africans, meantime, embraced the songs of Rodriguez, the Detroit singer of recent "Searching for the Sugar Man" fame. His catalogue was mostly shunned by government-run radio there. Nelson Mandela languished in prison on Robben Island, where he would spend 27 years. The evening of the 22nd, people braved a fierce rainstorm as they filed into Albany's Bleecker Stadium, passing through a maze of security checkpoints, the likes of which would not be seen again until after 9/11. 300 die-hard rugby fans were there to watch the match, while Pete Seeger led more than 1,000 protesters — who had marched there from two sites: the state capitol and UAlbany's uptown campus — in the African folksong "Wimowey." Police decked out in full riot gear were everywhere. A local minister quipped, "This will go down as one of the blackest Tuesdays in American history." Again, Mark Mishler. "What I think is really important is what came after that, which is that there was a movement in Albany of people of who were aware of what was happening in South Africa, people who were aware of our government's role. People who took seriously that there were connections between what was happening in South Africa and issues and problems that we faced in his country." The Springboks, ranked at the time as one of the best rugby teams in the world, defeated the Eastern All-Stars, 41-0. There was no violent outcome. No clash, no bloodshed. South Africans eventually defeated apartheid, and the movement's central figure, Mandela, was set free. Vera Michelson: "We ended our efforts in 1994 as an organization when the elections happened and Nelson Mandela became president and the whole country had changed and aprtheid was over. We felt like we had done so much work with so many good people. We felt as though the South Africans had called, and we in the international community and in Albany, had responded." The same scene played out repeatedly at political rallies in South Africa's dusty black townships two decades ago: Nelson Mandela's then-wife, Winnie, would electrify the crowd by lashing out at the white government. She would fire up the young men with her heated rhetoric, tapping into their grievances and leading them into frenzied chants and songs of liberation. In April 1994, the world watched as millions of South Africans — most of them jubilant, but many wary — cast their ballots in that nation's first multiracial election. 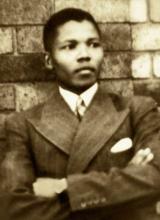 The outcome: Nelson Mandela became president of a new South Africa. Mandela's journey from freedom fighter to president capped a dramatic half-century-long struggle against white rule and the institution of apartheid. This five-part series, originally produced in 2004, marked the 10th anniversary of South Africa's first free election. It was the spring of 1999 in Moscow, and two of the 20th century's great revolutionary leaders were having their first face-to-face talks as presidents of their nations. 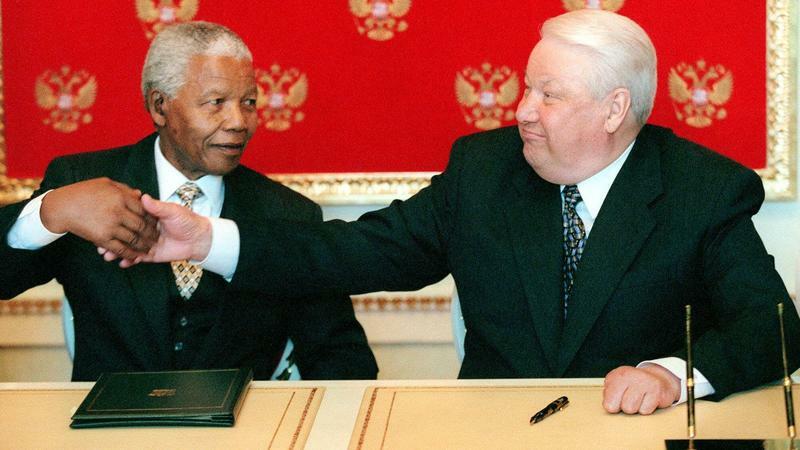 South Africa's Nelson Mandela was meeting Russia's Boris Yeltsin. I was in the Kremlin's great hall to cover the historic meeting for the South African Broadcasting Corp.
Mandela was 80, his hair gray and his movement stiff, but he was still very sharp and aware, with that famous glint in his eye. Today on Vox Pop, we open the phones for a remembrance of human rights icon and former South African President Nelson Mandela, who died yesterday at age 95. You can post your questions and comments here, on our Facebook page, tweet us @WAMCVoxPop, email voxpop@wamc.org, or call 1-800-348-2551. Albany Law School Dean Penny Andrews grew up in apartheid South Africa. Years later, Nelson Mandela wrote the foreword to her book The Post-Apartheid Constitutions: Perspectives on South Africa's Basic Law. In 2005, Dean Andrews was a finalist for a vacancy on the Constitutional Court of South Africa, the highest court on the country’s constitutional matters. South African anti-apartheid hero Nelson Mandela has now spent a month in the hospital. As visitors from around the world share an outpouring of love and support for South Africa’s first democratically elected president, there has also been a question of what his legacy will mean for both South Africa and the world. Albany Law School Dean Penelope "Penny" Andrews grew up and began studying law in apartheid South Africa before coming to the U.S. in the 1980’s.